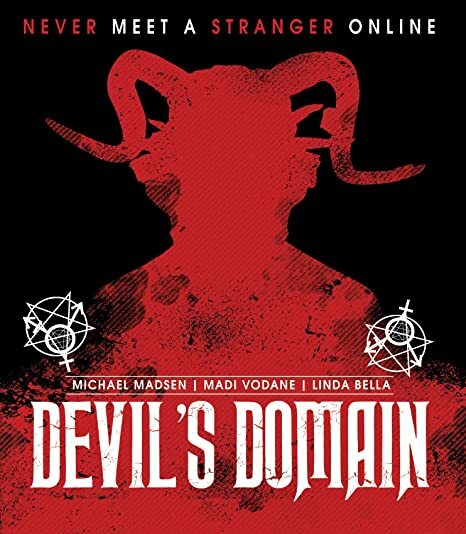 The Devil's Domain - BUY ON DVD! Devil's Domain tells the story of LISA POMSON, a troubled, social media obsessed teen, conflicted with her sexuality and her parents misunderstanding of her. When Lisa gets secretly filmed binging, purging, and masterbating the video goes viral and she suffers extreme cyber-bullying. Suicidal, and on the brink of insanity, a beautiful, mysterious stranger (the Devil) strikes up an online relationship with her. They grow close and meet and the stranger offers to help in exchange for a favor. The devil will rid her of the bullies and give Lisa fame and fortune in exchange for a baby. Lisa agrees and as the bullies die one by one, Lisa's conscious kicks in and she regrets doing the deal. In a climatic finale, the Devil threatens eternal suffering and the death of her loved ones until she finally succumbs to give the devil a baby that will grow to reign terror upon the world. Featuring the music of : IGGY POP, DMX, THE ONYX, BRAINTICKET & more! THEN SEND IN YOUR NAME, ADDRESS AND 5 COMMENTS TO contests@efilmcritic.com. Put "WHAT GOES AROUND COMES AROUND BULLIES" in the subject line and cross your fingers. We will draw names and you could receive a copy.. Only 1 entry per household.